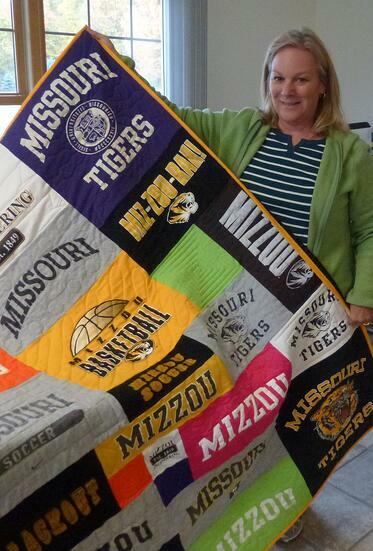 Too Cool T-shirt Quilts-Ballwin is located in the St. Louis, Missouri area and is owned by Chris Hejna. Similar to many little girls, Chris began sewing as a child, teaching herself to sew clothes for her Barbie dolls. Once in high school, Chris continued to sew, but instead of sewing for her Barbie dolls, she began sewing for herself by making her own clothes and prom dresses. Chris was then inspired to begin quilting after watching women hand piece quilts at her first job. Quilting became an important part of her life after that. Around 2002, Chris began helping make quilts for her children's school to auction as a fundraiser. After a while, Chris then took over the quilting committee, which is eventually what led her to T-shirt quilts. While chairing the quilting committee, Chris saw her first T-shirt quilt which was up for auction. The unfortunate quality of the T-shirt quilt made Chris feel that she could create T-shirt quilts which were much better. Encouraged by her daughters, Chris finally decided to make her own. Beginning with her eldest daughter's T-shirts, Chris made her first T-shirt quilt using the traditional method of square blocks with interfacing and sashing. Eventually, tiring from the corporate world, her job as a commercial property inspector luckily led her to inspect a whole-sale sewing shop which told her about Too Cool T-shirt Quilts. After reviewing the Too Cool T-shirt Quilt website, Chris knew she had found something she would really enjoy. In response Chris purchased a long arm machine and began practicing quilting with the machine. One year later, after much encouragement from her six children and the desire to finally be her own boss, Chris joined the Too Cool T-shirt Quilts team. 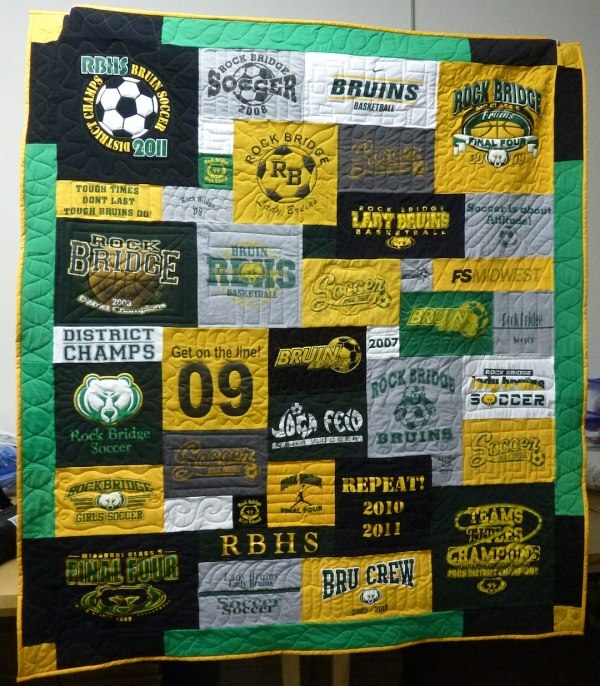 Now, as the owner of Too Cool T-shirt Quilts-Ballwin, Chris uses her years of experience and the Too Cool method to provide customers with quality Too Cool T-shirt quilts.